IRB leaves the beach and proceeds to a designated buoy and the crew dives into the water with a rescue tube and swims to a patient and tow them back to the awaiting IRB. The IRB then returns to shore where the driver leaves the boat and sprint to the finish line. IRB leaves the beach and proceeds to a designated buoy and picks up a patient and returns to shore where the driver leaves the boat and sprint to the finish line. 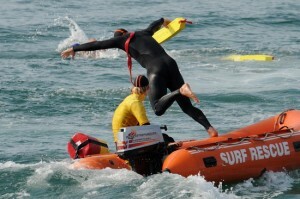 This is the similar event as the Single Rescue, but when crossing the finish line the driver returns to the IRB and makes a second pick up before returning to the finish line. 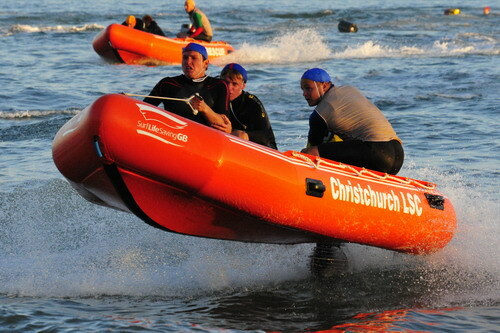 This is the similar event as the Mass Rescue, but when crossing the finish line the driver tags a second driver and crew who then returns to the IRB and makes a second pick up before returning to the finish line.